Man, there’s nothing like that first whiff of the ice and the promise of a new Maple Leafs season to put a smile on a Torontonian’s face. Once you get through the bomb dogs, airport-style metal detectors and security officers conducting bag checks, that is. Welcome to an NHL game in 2017. When I got down to the first pre-season game against the Ottawa Senators on Tuesday night, I noticed crazy lineups — not only one to get into the game, but a second one, as well. “Oh, that’s for the new bag check policy,” said Jess Schmalz. She and her pal, Elli Deboer, came in from Hamilton and found themselves turned away from the boarding area at Gate 1 toward a secondary area for checks of backpacks and bags. That lineup was even longer than the area at the main gates that look like you are boarding an airplane. But my feeling is it went a little too far. I was sitting with my pal, George Bigliardi, and right behind us were Sabrina and Saajid Bhayat, who come to a few Leafs games each year — never with an issue. Until now. Seems that a security guy wouldn’t let Sabrina in unless she turned over tiny nail clippers with little scissors attached. They were discovered by security personnel during a purse check. “It’s only preseason but it’s still nail-biting time,” joked Saajid. I was kind of embarrassed this women faced this sort of security, but she was a good sport about it. It’s just the reality of going to a hockey game in Toronto now. Sad that going down to a Maple Leafs game at the Air Canada Centre reminds me of when I was trying to get into ISAF headquarters in Kabul. The only saving grace for the law-abiding fans was none other than Air Canada Centre security man Angus Collis, who was really funny on the mega-phone and even showed off some dance moves. Keeping it light. Keeping it fun. Speaking of fun, everything was back to normal once we all got inside. Carlton the Bear was in fine form and people really enjoyed seeing new Leafs forward Patrick Marleau score his first goal in the blue and white — a beauty. This is what Toronto is all about. It was Helena’s first Leafs game. She plays centre for her team in Aurora and can’t wait to tell her friends about being at the game. For her, it’s the speed and artistry on the ice — and the taste of the ice cream and popcorn. She didn’t mention the security wanding, dogs or the bag check as part of the experience. But they were all part of it, too. 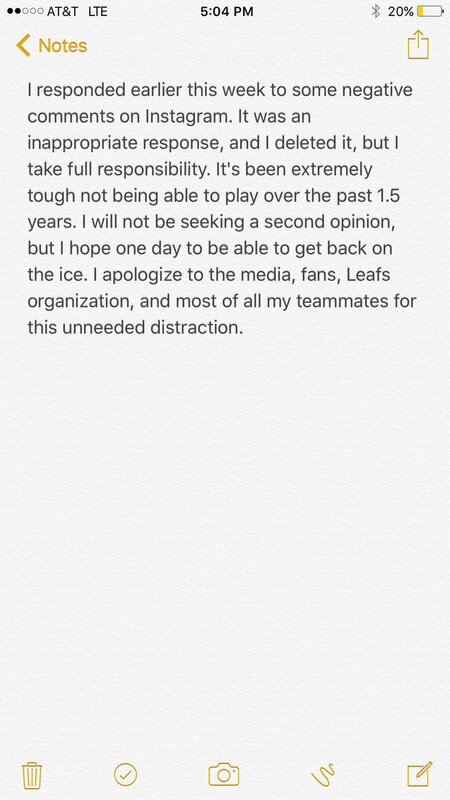 Joffrey Lupul has taken the high road and apologized. The Maple Leafs forward — at least on paper — took to social media on Wednesday to address comments he made earlier this week on Instagram. Several days ago, Lupul called out the Leafs, taking issue with general manager Lou Lamoriello’s assertion that Lupul had failed his physical on the first day of training camp. He added that he was “ready” and just awaiting a call. Lupul’s frustration with not having played since Feb. 6, 2016 — he had sports hernia surgery not long after — boiled over. He has one year remaining on his contract, which represents a $5.25-million US cap hit for the Leafs this season. On Wednesday, Lupul, who turns 34 on Saturday, addressed on Twitter his posts from earlier this week, which he had deleted. The tweet was his first since June 2016. QUEBEC CITY — The great hockey fans in these parts don’t need another Roch Carrier short story to rekindle their dislike of the Maple Leafs hockey sweater — and the hole in their NHL heart. Auston Matthews is about to reopen those wounds, though it’s nothing intentional on behalf of Toronto’s young centrifuge. When the Leafs met the Montreal Canadiens Wednesday night at Videotron Centre, it was another taste of what this town used to revel in during the Nordiques era, when its provincial team did battle on the big stage. The back drop was the joi de vivre in the stands at old Le Colisee, a true Quebecois feel that’s usually muted when Toronto plays at the Bell Centre with so many Leaf sweaters stacking the house. The grassroots passion for both the Nordiques and an appreciation for the game’s best entertainment made for many memorable evenings. In the more than 20 years since the Nords moved to Colorado, there have been various attempts to get an NHL team back, either through expansion or shifting a troubled existing team. How can the NHL ignore a proven northern market in favour of more U.S. experiments wail the locals, especially when some American teams struggle at the gate and Quebec took a huge step by building the major-league $400 million Videotron rink? That’s where the arrival of Matthews is having an adverse effect. Born in California and raised in Arizona as a fan of the often-endangered Coyotes, his rapid rise in status is validation to many in the league’s New York office that its Sun Belt bet — rooted in Wayne Gretzky’s move to Los Angeles — is paying dividends. Matthews was a burgeoning baseball player who fell in love with the game on a half-sized rink and is among a number of NHLers sprouting from non-traditional hockey states such as Florida and Texas. Last season, Nashville made the Stanley Cup final and, on Tuesday, the Vegas Golden Knights played their first pre-season home game in front of more than 17,000 at T-Mobile Arena. Kansas City and Houston are still on the NHL’s radar, if Seattle doesn’t line up its internal competing interests and gets a team first. All of that is pushing Quebec City further down the line, instead of making it a slam dunk to be the league’s evenly-balanced 32nd team. Led by a potential ownership group of Quebecor publishing — a media company which had the $500 million US expansion fee in hand in 2015 — they might not be the only Canadian city in the picture. Saskatoon, eyeing Winnipeg’s successful comeback as a small market entity, keeps making noise about its own team in the 15,100-seat SaskTel Centre, site of recent NHL exhibitions. At least the Leaf resurgence with Matthews and a fleet of rookie stars has taken the wind out of creating a second Toronto team. The last time the Leafs were in Quebec City was March 5, 1994. The club lost 4-1 to the Nordiques and their talent-laden roster topped by Joe Sakic, Mats Sundin, Valeri Kamensky, Mike Ricci and Adam Foote. Two years later, many of those Nords, minus Sundin, won the first of two Stanley Cups in Denver. That young guns demographic is another reason to feel jealousy here, as fans watched the spry and stoked Leafs, structured along the same lines as the early-'90s Nords, who also hoarded top draft picks. Quebec’s version of the Matthews ticket was Eric Lindros, who didn’t want to play for Nords owner Marcel Aubut and was eventually cashed in for the players who led the transplanted Avs to glory after the 1995 sale. Aubut cited the terrible business climate of the day, a Canadian recession, the regional politicians’ unwillingness to pay for a new rink at that time and rising salaries that had triggered a lockout in the ‘94-95 season. There are still tax drawbacks but now the city is back on board. The junior Remparts are still a huge draw, peaking at close to 14,000 fans a game in 2015-16, better than NHL trouble spots such as Carolina. But as long as the NHL has teams such as Tampa Bay, Quebec is going to be a bridesmaid, unless there’s spectacular failure with a current team needing a ready-made home. Local beer, fine food and friendly staff are plentiful at the Videotron Centre, but its soaring ceilings and wide concourses are still missing something. Where you can’t go five feet in Toronto's rink or Montreal’s rink without encountering a team-themed shop or promotion, it was weird to walk the halls of a big-league rink on Wednesday and not have home-side propaganda in your face. In this NHL-starved city, the only signs are of a past life, the retired numbers of Quebec Nordiques Marc Tardif, Michel Goulet, Peter Stastny, J.C. Tremblay and the 1977 Avco Cup banner from the WHA. On the main concourse, a Guy Lafleur Nords sweater was at an auction table beside Jean Beliveau’s, near a Canadiens pop-up shop and a showcase for the famous Quebec PeeWee tournament. But everything else is geared towards Videotron’s current tenant, the QMJHL's Remparts. There are excellent views of the ice, owing to the sharp angled seats and the private boxes which the Nords wished they had to help the team stay afloat in the 1990s. The highest end-zone seats are curtained off now, but that won’t be the case if fans in the 18,000-seat arena had an NHL team to get behind.